We decided to make our own sauerkraut, and to try a new method for pickles. 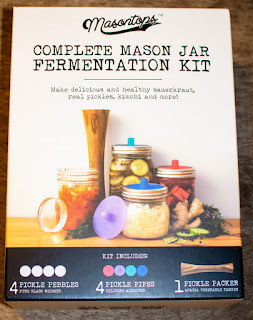 My husband purchased something similar so he could make small batches of specialty sauerkraut. He has a fancy crock that he purchased from someplace in Germany for larger batches. The top is such that there is a "water seal" to keep air from getting to the cabbage.